For a long time, the discussion around SEO and copywriting was one of conflict. Concise messaging versus a length that search engines will notice. The most benefit-driven heading for the job versus the one that includes the right keywords. Today, though, search engines are more sophisticated. With the right support from an SEO specialist and a copywriter – in most cases not one person who professes to do it all – you can strike a balance that improves visibility, gets people to your website, and then engages and converts them with strong copy. I’m delighted to have Gareth Simpson on the blog – someone that’s seen the evolution of SEO first-hand – to talk about that balancing act between copywriting and SEO. Read on for some practical tips on building relationships with robots and people alike. You don’t get something for nothing. Take this blog. I spend my time writing and promoting posts, sharing thoughts and advice on life as a freelance copywriter. And I don’t get paid for it. But I still expect a return. It’s nice to see my subscribers list growing. It’s lovely to get some feedback. It’s great that people share my website through social media, and Google (reluctantly) starts caring about what I do. If I didn’t believe that blogging delivered some kind of return, I wouldn’t do it. I have better uses for my time. So you get to read the blog for free. And it turns out that giving something away is a particularly potent form of persuasion. 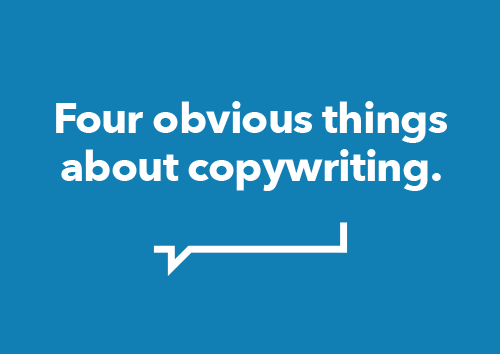 Copywriting is about getting people to do things. You might want someone to buy. Or think about a specific idea. Or hire you as a freelance copywriter (hello). But there’s a problem – people don’t want to do what you say. In this Swiped post, we’ll look at an example of overcoming that natural resistance to persuasion – by putting the initial decision firmly in the past. This is Swiped. It’s a series of posts that’s like a swipe file, but with some insight into why I like particular things. For the first post, we’ll be looking at one of the content marketing greats – Copyblogger. Whether you agree with what they say and the processes they recommend, it’s undeniable that their website features some great copy that’s tailored to the right audience. But Swiped doesn’t look at generalisations. This isn’t an expansive post, but a precise one that focuses on one aspect of copywriting. This time, it’s something that I’ll call inverted emphasis.